* MIKE MARINO: MAKE AMERICA ITALIAN AGAIN TOUR. You guys don’t want to miss Comedian- Mike Marino! Trust me when I tell you that the “clean” working Marino- will have you guys laughing your collective asses off, all night long! 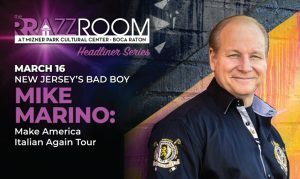 Stand-up comedian Mike Marino – affectionately known to fans as “New Jersey’s Bad Boy” – brings his hysterical take on the Italian-American experience to The RRazz Room at Mizner Park Cultural Center! A native of Jersey City, Mike’s material is largely inspired by his own life, from his Italian family roots to his edgy observations about everyday life. His riotous approach to stand-up has taken him from The Tonight Show and Comics Unleashed to sitcoms – including appearances on Frasier and Becker – and major nightclubs, theatres, and casinos from New York City to Los Angeles and around the world. Mike has also been a highlight of Montreal’s Just For Laughs Comedy Festival for seven years in a row. And in 2008, Marino was inducted into the New Jersey Comedy Hall Of Fame, and on 2015, he was awarded the USO Bob Hope Comedy Award for his regular performances for our US military. He currently appears on his own DDV Radio Show Live From My Mother’s Basement. and on a new web series, “A Marino Moment In History,” only on YouTube.